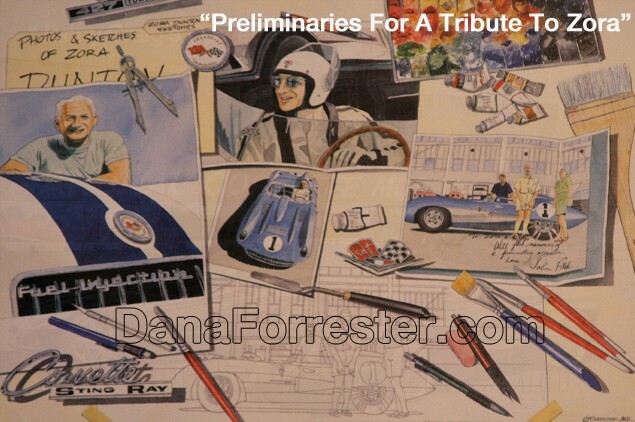 How long have you been working on automotive art Dana? Since about 1990. I'd been doing a lot of architectural and the old brick wall signs and reached a point that I needed to make a change and take a breath. 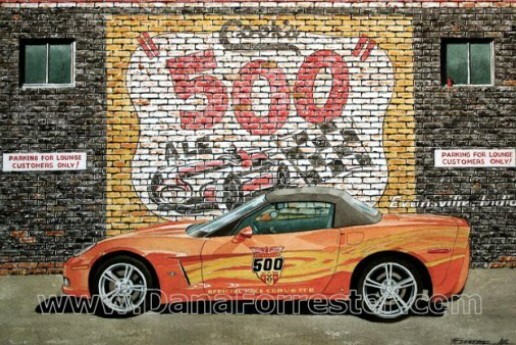 A Corvette ended up in front of a brick wall sign and it was a huge hit. So that really took off. So before that, you were doing murals with other cars. That's right. They were much more complex than what I am doing now with two and three layers of signs. It became a puzzle and a mental challenge to figure out what they said and it was very complex. Every single brick was painted at least two or three times and I needed to lighten up a bit. So the attention was suddenly on the Corvette instead of the wall. Exactly and it created a whole new market that was much more vigorous and really allowed me to exhibit nationwide and have a nationwide following. I ended up in the American Works Catalogue and they started carrying more and more of my work and it just continued to grow. So I feel that this really made me a vital part of the Corvette hobby. I constantly photograph possible background material and have probably got between 15 - 20,000 photographs that are unused. It sort of boils and formulates in my mind, often appearing about half an hour before I wake up in the morning. You could say that you almost have two signatures in your style, one being the murals as a background and the other being the Corvette. So why the Corvette? Well I'd always wanted one from the age of 12 or 13 years old but was never able to buy one until 1987. That car is what led me into the Corvette series. 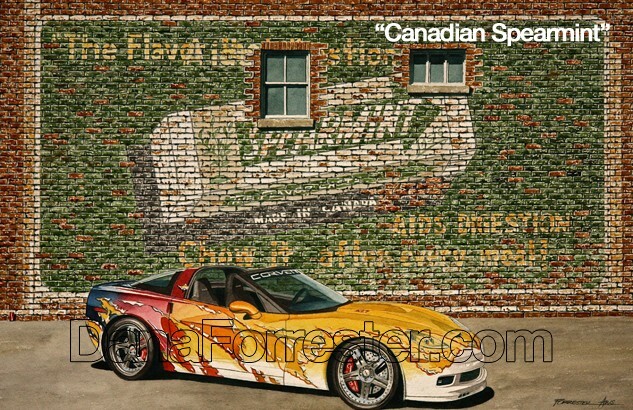 I was paintings Corvettes for myself and not for display and kind of stumbled into the brick wall series. I've come to really enjoy the Corvette. I like to paint virtually every car but they have to have some excitement. I don't like mundane cars. 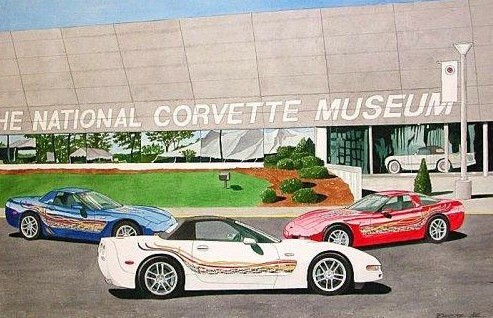 I see that although you have painted a Mustang and a Porsche, 95% of what you do is the Corvette? Yes well I do a number of Corvette events across the country and Mustangs don't sell too well at a Corvette show. With Corvette coming out with a new generation, it makes for a whole new series of subjects for me. I enjoy the older Corvettes because of the styling and feeling and a different place in time. Yes I like the '63 to 67's series, which we initially called the mid years and now people label them the C2's. I really like that series and I'd like to have more of them. So you still own your own Corvette today? Yes we have three. At one point we had four but it became a difficult number to manage. So we sold one and now have three. I've got a Callaway which I am going to sell and buy a new one. Do your murals have a special meaning? Well it started with the early cars and I wanted to put the car in the setting it was when it was new. I wanted it to reflect the era at that time and then it got to the point where I started putting the newer cars in front of the old signs and I realized really that those signs are still around. They're not new anymore but it made them even more fascinating. It's the contrast of the smooth slick glossy car finish and the rough textures of the brick wall signs that I like. The kind of a context where the contrast is really part of the subject. 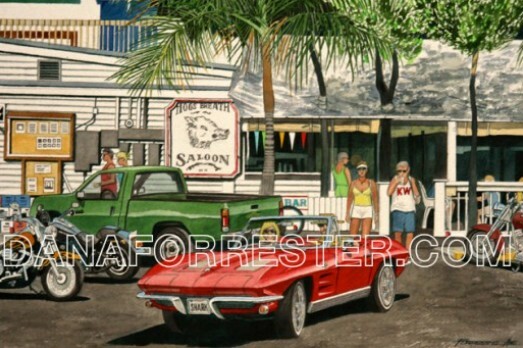 Your cars are mainly stationery and the focus is on the car but your Key West series show the day to day life and the role of the car in the scenery. That's right and one particular scene has the original Jimmy Buffets Margaritavill in Key West. I saved a yellow 58 corvette for years not finding a good location for it until I put it in front of that scene. It's somewhat based on the romanticism of Key West and the tropical colours of the restaurant really lent itself to that. It went very well with the colours of the restaurant. What kind of emotion do you want to trigger with your artwork? Well as far as an emotion goes, I want the viewer to relax and enjoy the visual of it. One of the things I've always wanted to do is to look at parts of the world which people don't usually pay attention to, and have them look at it as an art form. I positioned that particular restaurant in Key West and took the photographs from a straight on angle which people don't usually view. Because they are driving straight down the street and looking forward at a 45 degree or 90 degree angle, they don't see it. I think the reason why a lot of people like my work is because it's a different level view than they are used to seeing. How do you do that then with cars. Do you use the same technique? A little bit but usually I don't view the car straight on, I try to do an angular view somewhat because I want them to contrast in the level and directional view. 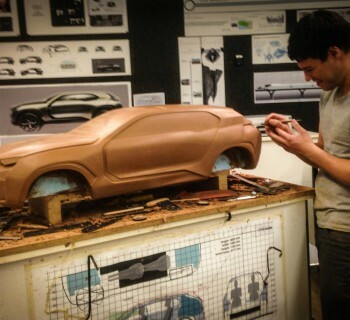 The car can be angular and it's more appealing when it's against a solid straight view of a building. If you put the two together, and I do occasionally but rarely, it's almost too much of the same view. Most of your cars are stationery and not mobile. Is this on purpose Dana? Yes it is on purpose. I will do some things in motion but there's a lot of other artists who do that. Therefore I want to stay away from it. A lot of other artists focus on the detail and those are great but I try to keep my work original. To me, this is pure me and not somebody else. That's not to say that I don't occasionally take a cue from somebody else and adapt it. How do you start with a new artwork? What is your inspiration? Usually it's in my head. I have a mental list of the cars I would like to paint and when I am at a car event, I take photographs. Or I seek out specific cars at specific angles and reflections and then I file them in my computer and my head. I constantly photograph possible background material and have probably got between 15 - 20,000 photographs that are unused. It sort of boils and formulates in my mind, often appearing about half an hour before I wake up in the morning. I'm an early riser and get up at 5 a.m. and in the bath, I have a notebook of things I want to add to future works and also on my I-phone. Do all the murals you paint really exist somewhere then or are they made up? Most are made up. I do take ideas from different places but then I look at the original ads and often change them because some of those elements really don't work as a painting. There's products that I can recall from my childhood and then I go and search on google images to see if there is any record of what the designs look like for a particular product. I did one recently of King Midas flour. I found a sign in Madison Wisconsin about 25 years ago when I was there for an art festival which was orange with blue lettering. It was very well preserved, sandwiched between two buildings and then the buildings got torn down. I photographed it but never painted it. I went back to my file and found the way that I had photographed it and it eventually evolved into a new painting. So there's lots of things that have stood in the back of my mind for 25 years or more before I have used it. Are you ever challenged by the Corvette world about the details of your work? 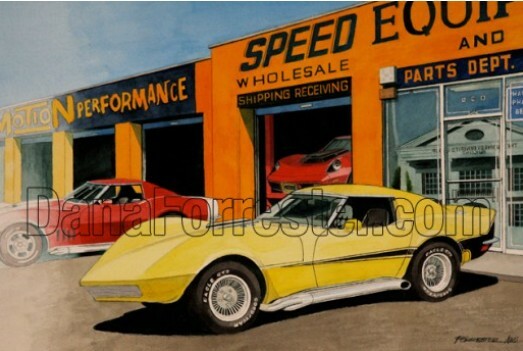 That King Midas Flour ended up with a new C7 model Corvette in a similar colour range of blue and that worked out well. 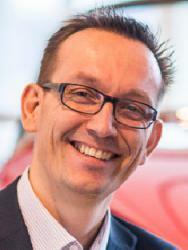 But I really make sure that all my details on the cars are really authentic, especially with the earlier Corvettes. I am a master judge with the National Corvette Restorers Society who are extremely meticulous about restoration detail. 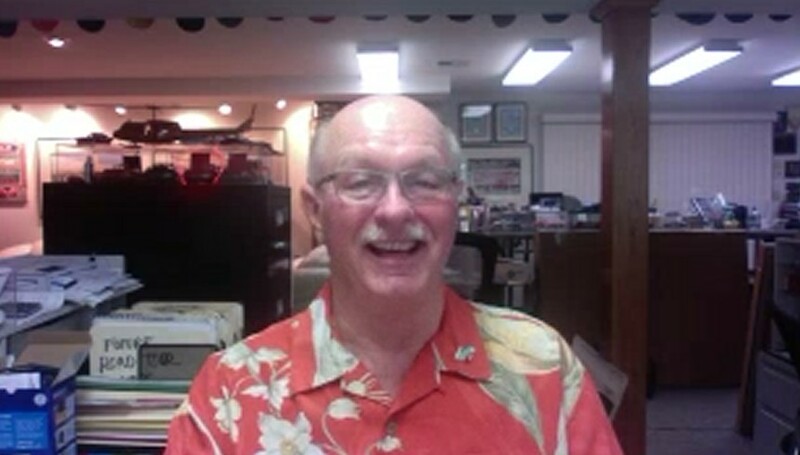 I am also a Board of Directors member with them nationally and also a board member with the National Corvette Museum. So I've gained a lot of knowledge being involved with the earlier cars. You paint the exterior but do you sometimes paint the engines as well. I've had a lot of requests for engines and I'm only now beginning to feel as if I want to move in that direction. I've done a couple of Corvette interiors, as if you are ready to grab the steering wheel. One was a 1960 red interior and a 1965 black interior which I did in great detail. But I am just finding the right way to approach the engine series. I know the engines I want to use but the light is a different challenge. Do you always use watercolours? Yes, everything I do is in watercolour. When I studied in school, I had to paint everything. The most frustrating I had was with watercolour. I had a full year with a feller who wanted us to paint Mexican landscapes. I had no idea what a Mexican landscape looked like. My degree was initially in art education, so he was an inspiration for me to do a lot better job than what he did. For 15 years I taught advanced level art before I went into business full time. I did paint in oils and acrylics and did a lot of pencil work. Eventually though, the challenge that I presented myself was really a driving force for me and made me develop my own style and not a traditional watercolour style. So I've stuck with water colours. In 1981 I was elected a signature member of the American and International water colour societies and I'm still one of the few people who belong to both. I keep looking at new things and I've learned that there is always a new way to approach what I do. Are there certain artists you like who also work with water colour? There have been some who I've really enjoyed. There's an American artist called Andrew Wyeth who works in water colour and Ed Tampera. There are quite a number of other water colour painters. My real influences have come from (one that a lot of artists disdain, Norman Rockwell). He is considered an illustrator. Most artists don't consider him an artist but I do. I think I understand him better. It took me a long time to understand their influences on me. One was Andy Warhol with his coca cola bottles and his elevation of everyday mundane objects into an art form. At first I really didn't like it but eventually I figured out he had a great influence on my advertising signs on the brick walls. Well it crept up on me. I had the influence and didn't realize it for probably ten years. Piet Mondriaan also had an influence on me. The way I do my buildings with the lines and positioned signage, is much like his compositions were and how he dealt with vertical and horizontal structures. When I was in school, I didn't like either one of those fellers but probably my dislike for them created an indirect influence. 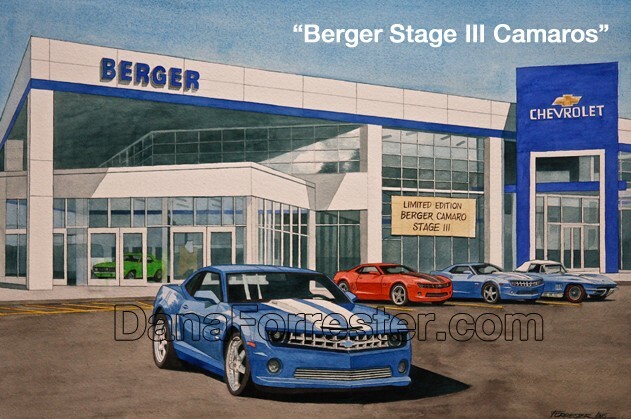 The feedback I usually get is that the fine art sector does not recognize automotive art. What is your opinion on that? Oh I think that's right and I've got to say that I was guilty of that myself when I was teaching. A lot of my students, especially the boys, only wanted to draw cars. So I would limit how much they could work on cars, in order for them to be a little more rounded in their appreciation. I wanted them to do some still life, landscapes and a variety of things. Fast forward twenty years and what am I doing?... automotive art! I had some flack from some of those students who said that I didn't allow them to do it and yet here I am painting automotive art. Should it belong in the fine arts category? I think it should. I think a lot of people who are involved with museums and higher level of education are too limited in their scope of what they consider as art. They believe that art should create conflict and should force people to make a radical decision. They disregard things which they consider less than controversial. If you look at Normal Rockwell, he was not really respected during his life but now his work is pretty valuable. Why do you think that is? I think he was documenting daily life as a heritage. Exactly and you see, that's a different motive than the elevated people artistically feel. They don't want to see everyday stuff. They want to see something that is going to create a reaction... whether it's good or bad. They don't care if people say I hate that. Good! That's the whole reason you created it. I don't go with that. I think it allows a lot of people to create those feelings who (and this going to sound bad), can't create really good visual art. It allows people to create things without a lot of thought and make it valid art. Therefore it enlarges the number of students they can put into the schools that have no talent. Talent is not necessarily essential but I think it's part of it. That may be a controversial statement but that's the way I see it. I agree. 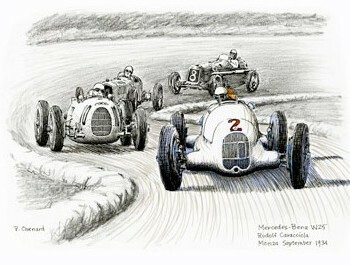 If you want to create automotive art, you need to master the skills of drawing and sketching etc. Abstract art might be easier, don't you think? It all depends. If you came to my house and saw our collection, you'd see a lot different work than my work. My studio has been built at a lower level of 2000 square feet and it's all my work. But you won't find my work up in the house because we've collected a lot of art from people whose work we really like. Much of it is non objective abstract dealing with a lot of textures, whether it's clay or glass. It's more of a contemporary look and when people go from my studio to that part of the house, people look at me and say 'really? So it does influence you in your daily work? Oh yes and I really enjoy good challenging abstract or non objective work. I really do. But it doesn't necessarily influence me. I think all artists should stay objective as to what their feeling of art is. 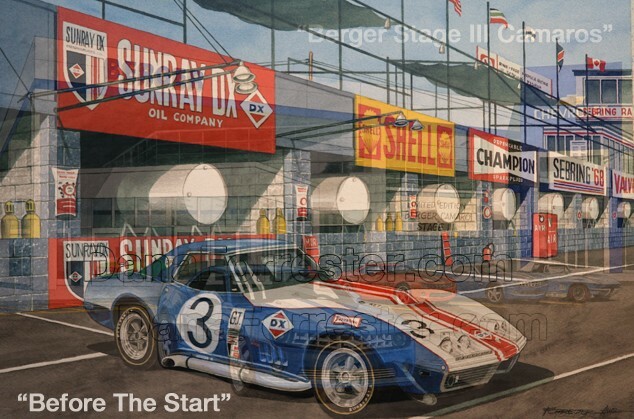 What do you think is needed to get automotive art in the main fine arts stream? There are a series of exhibits going right now. There's one I'm looking forward to seeing in Indianapolis next week and they have a display of radical concept cars from all over the world. There are more and more museums that are looking at the design of the automobile and realizing that it's really an art form. There have also been a number of museums in this country that has done that. One New York museum had the cars of Ralph Lauren and I don't know if any of those cars are going to be in this exhibit in Indianapolis. 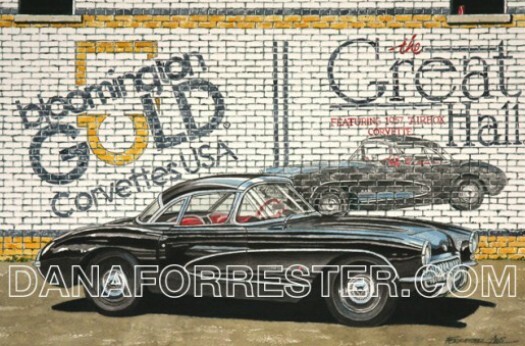 But I think that is the best avenue for automotive art to move up and be noticed in the art world. I think it's kind of beginning with the elevation of the design of the cars. It sounds as if we are on a tipping point then. Yes I think so. I started really painting in the mid 70's while I was teaching and exhibiting at a lot of art festivals which have become very popular for regular people to view art. In fact it created such a boom in the art world in the United States that I would almost label it the second renaissance. There was such a large influx of people creating good art. It's kind of plateau'd and slackened off because I think the newness wore off a bit, but there was so much new creative work from the 70's through to the 90's. It's still there but not in the large influence it was. 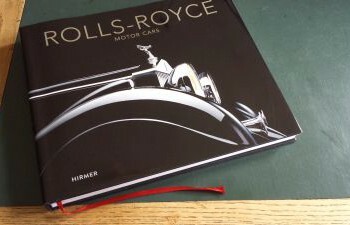 So for any new automotive artist starting out, what kind of advice would you give? Stay true to yourself. Paint what you want. Try to be yourself and not someone else. Fortunately I was able to find that niche but when people want to get noticed, they have to create something different from what people are used to seeing. It's hard but for people who can do that and can create something new, it's the best way to head for success. Final question. What is still on your bucket list? I went to Paris in 2008 and I started a Paris series, but I only got one piece done. 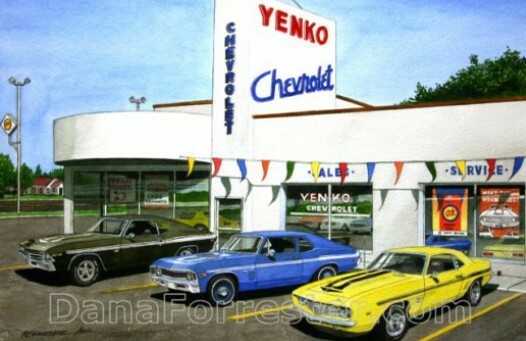 I would like to get back to that and do some of the store fronts and markets with the bright colours and not necessarily use any automotive series with it. Or I might but that's what I I would really like to do. My wife and I may go to the Pebble Beach Concourse in August. I am interested in doing something of an overview of several cars or many cars at that event. I want to try to create a slice of that which is different from what I've see anyone else create. I'm not sure exactly what I will find when I get there but I'll just kind of photograph everything that I find interesting and then worry about it later. 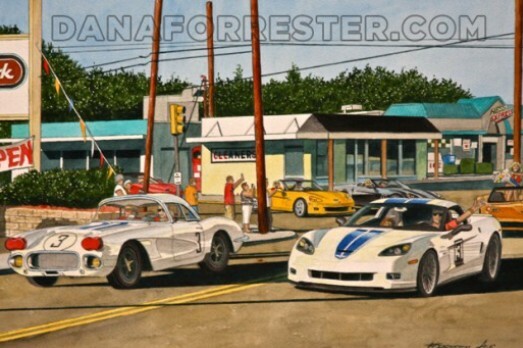 To see more of Dana Forresters work, please visit his website.